Can be used on Cars, SUV,s & Trucks. 1-1/4" tube includes adapter for 2"
Rated at 500 lb Capacity. 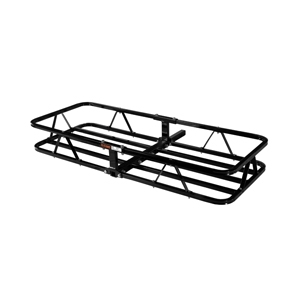 NOTE: CURT Manufacturing recommends the use of hitches showing a Weight Distributing (WD) rating when carrying a personal mobility vehicle (power wheel chair, scooter, etc.). Use of a lower capacity hitch may void warranty and could result in damage to both the carried and carrying vehicles. For more information, contact the CURT Technical Support Line at 1-800-798-0813.